If a chronically ill Medicare patient stops taking his medication, Dr. Jim King finds out about it within a week. That's because one of his staff calls to find out, learns why and then follows up to remedy the issue. This way of working has improved the health of his patients and saved—even earned—his practice money. Since January, the CMS has covered monthly expenses for chronic-care management of patients not conducted during a face-to-face patient visit. The CMS reported that about 35 million Medicare beneficiaries are eligible to receive these billable care-management services. But the agency has received reimbursement requests for only about 100,000. 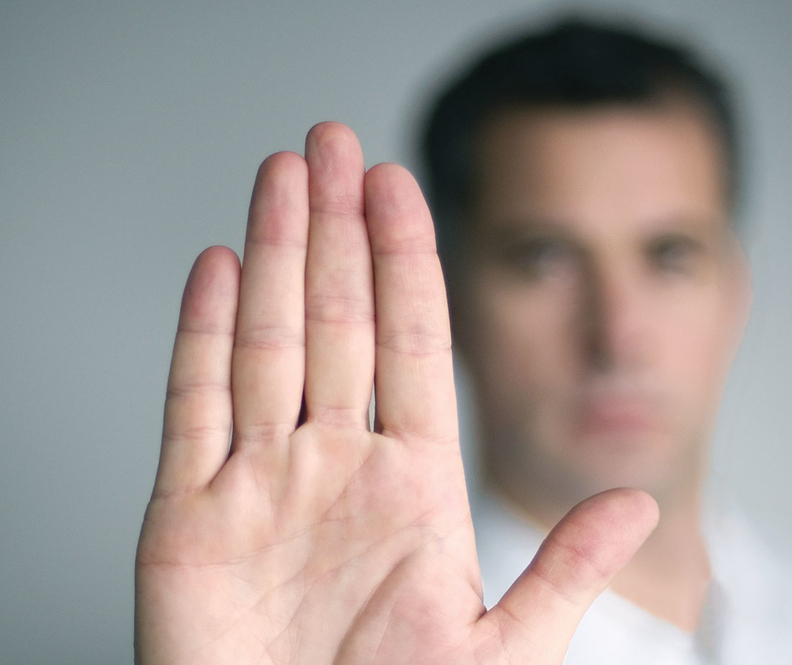 Complaints about the chronic-care management reimbursement program vary from lengthy documentation to having to have a difficult conversation with patients who now are responsible for a 20% copayment for previously free services. Primary-care advocates hoped the care-management fee would transform some practices, encouraging them to invest in infrastructure and adopt a team-based model of care. And that's happening for some, like Dr. King. Practices that approach care with a team effort have an easier time fulfilling the requirements needed to obtain reimbursement for chronic-care management. He's hired a registered nurse, two licensed practical nurses and a clerk to join the five doctors and six nurse practitioners at his three-clinic practice in rural western Tennessee. The Prime Care Medical Center staff are now making follow-up calls, monitoring patient-care plans, reviewing test results and consulting with the patients' other providers. For the CMS to pay for those patient calls, they must add up to at least 20 documented minutes a month. King said calls vary widely, with as few as 17 minutes one month to 70 the next. Also, several minutes of unpaid preparation are often done before calling a patient. The CMS' average monthly reimbursement per patient is $42. Prime Care has care-management patients with diabetes, hypertension, heart disease, chronic obstructive pulmonary disease and hyperlipidemia. Patients with arthritis and other chronic conditions will be added later. An Annals of Internal Medicine practice-modeling study published online in September showed a “typical” practice with about 2,000 Medicare patients could generate more than $75,000 net revenue per full-time physician if half of their eligible patients enrolled in chronic-care management. They calculated that if a practice hired a registered nurse to work full time on care management, it would need to enroll at least 131 Medicare patients to break even. If they hired a licensed practical nurse, they would need to enroll 76. Prime Care embraced chronic-care management in part because it was an early adopter of the patient-centered medical home practice model, a team-based practice that concentrates on providing coordinated care. All of the Prime Care clinics are recognized by the National Committee for Quality Assurance. One carries the group's highest rating. 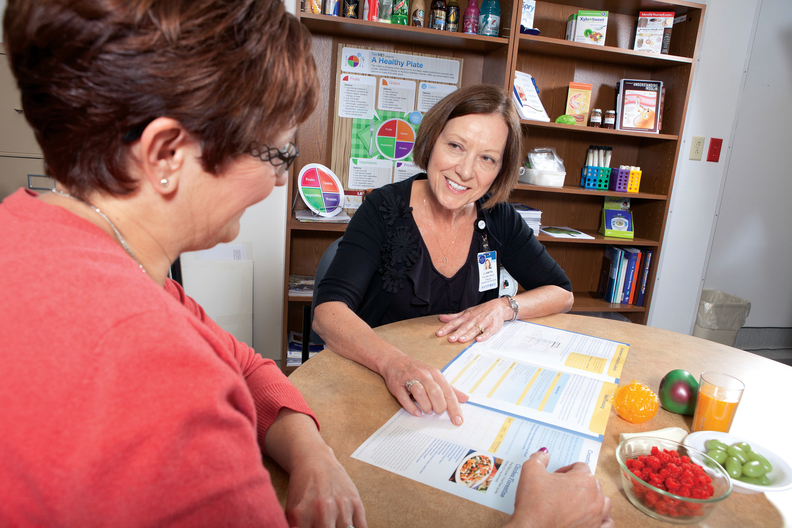 A Sanford dietitian, right, advises an Iowa patient as part of its existing care-management program. It plans to start billing Medicare only early next year. Medical home practices are at an advantage in meeting the care-management requirements, which include obtaining patient consent, recording data in a standardized format, and creating a care plan with an expected outcome, measurable goals, and strategies to manage symptoms and medication. But the detailed documentation needed has led to criticism that chronic-care management is just another paperwork-generating government program. “We're concerned about whether we're just checking boxes or are we really moving the needle on improving health,” King said. “I'm not sold on everything yet, but the only way you'll know is if you give it a try.” King said he and his partners will re-evaluate their participation this December. The CMS has recognized the perceived shortcomings associated with this new billing code and has asked for ways to improve. The Family Medicine Clinics of the municipally owned, Avera-managed 25-bed Floyd Valley Hospital in Le Mars, Iowa, are an NCQA-recognized patient-centered medical home. The seven physicians, two physician assistants and two nurse practitioners each run their own care teams consisting of two RNs or LPNs as clinical assistants plus a patient-services coach. Clinic Administrator Julie Sitzmann said that means they can deliver the required care-management services. But they aren't using the code because of the resources needed to complete the documentation. “At first sight, your thought is, 'For 40 bucks you want us to do all this?' Forget it,” Sitzmann said. “Then you read closer, and it's stuff we're already doing—and documenting.” But the clinics' EHR is not set up to record the minute-by-minute level of documentation required, so they're taking a pass. Dr. Mark Belfer, chief medical officer of the 1,350-member Greater Rochester (N.Y.) Independent Physician Association wants the CMS to do a better job of advertising the code. In fact, a survey of 300 primary-care physicians by tech startup Smartlink found that two-thirds of them were unaware of the program or unfamiliar with its details. The survey also found that almost half of the doctors who weren't participating said they were “waiting for corporate to decide." That finding reflects what's happening in systems like UnityPoint Health, a West Des Moines, Iowa-based system with $1.9 billion in revenue in the first half of 2015. It's about to launch a pilot at one of its 240 clinics next month. Sioux Falls, S.D.-based Sanford Health has 250 clinics across nine states, and it also is already fulfilling the CMS requirements. It will start seeking reimbursement from the CMS for its chronic-care management program by the first of next year. She added that Minnesota Medicaid is also paying a comparable fee for care management, but without a copay. She added that most commercial plans pay between $45 and $50 for managing patients with two chronic conditions and even more if a patient has five or more chronic conditions. At CHI Franciscan Health, based in Tacoma, Wash., they're testing a small, diabetic-focused, team-based pilot using a care manager, clinical pharmacist and diabetes educator. Sherry Aliotta, associate vice president for care coordination at the Catholic Health Initiatives-affiliated system, said it embeds care managers at its medical homes and has invested in educating nurses to fill these roles. With commercial plans and now the CMS providing payment, there's money to support the staffing required for a successful chronic-care management program, Aliotta said. She set up her first care-management program in 1995. King noted that it's not necessarily more or less work—it's different work. 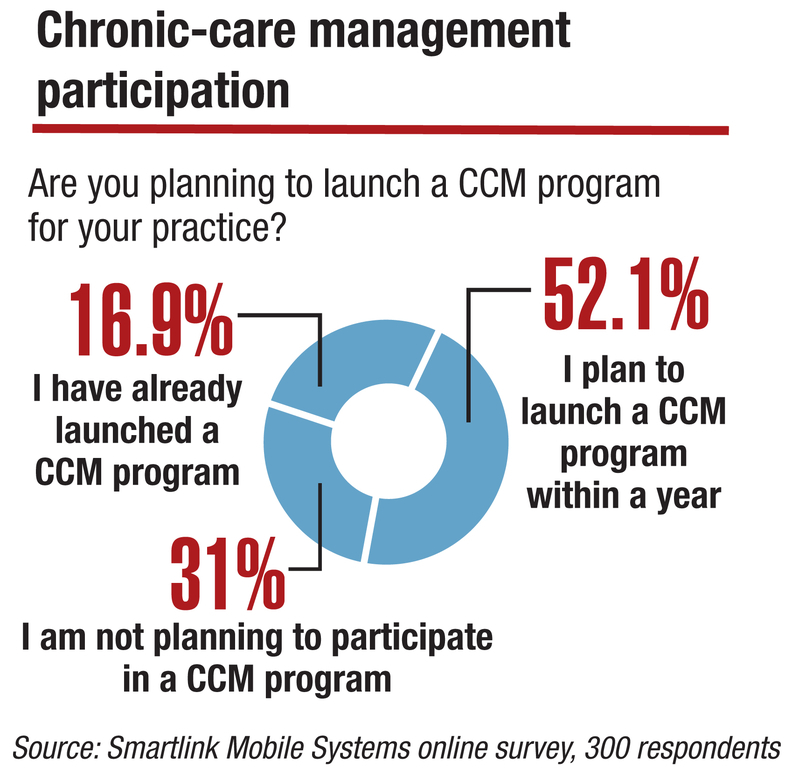 In a Smartlink survey, 41% of doctors not already participating in the chronic-care coordination program said they were "waiting for corporate to decide." An earlier version of this story suggested that was the percentage of all respondents.